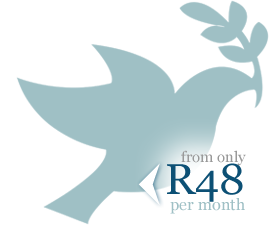 With FNB, you can buy a funeral policy for as little as R35 per month for R10-000 cover. But covering just yourself is very uncommon, and like most insurance providers, FNB funeral cover offers you option to extend cover to your spouse for a fraction of what it would cost for a stand alone policy. For just an additional R25 per month, you can get cover for your spouse or living partner for the same amount of cover as yours. You (as the policyholder) and your spouse have to have the same amount of cover under your policy. As mentioned before, your spouse's cover will cost far less if you include him or her in your policy. FNB or First National Bank is the largest financial institution in South Africa. As a result of its success in banking, it has expanded into insurance as well, and offers compelling funeral insurance policies for you and as you read above - affordable extended family cover. You can learn more about FNB funeral cover information so that you can be in a better position to buy funeral insurance either from the company or any of our own providers. You'll have the added value of FNB's Double Accidental Death Benefit for you and your spouse for cases where you and significant other are involved in a fatal incident. FNB will payout within 24 hours, no questions asked because they can access the death certificate from Home Affairs on your behalf. All members you have covered under the plan will be covered for life, granted your premiums are paid every month. And you can have up to 21 family members on a single plan. If you have children, they should be covered for equal amounts, and each child's premiums can cost as little as R6.30 per child. FNB does not give information about how many children are allowed in each policy, however, this is a minor hurdle and can be discussed in the terms of your policy. In your policy you can also cover your parents and in-laws for equal amounts. They can have funeral insurance of up to R15-000. However, there are age exclusions to when you can take up FNB funeral cover for parents and in-laws. The company stipulates that they should be under the age of 74. Other benefits to being with FNB are that you can double your accidental death benefit to a maximum of R120-000. This benefit is also available to all beneficiary members in your policy. And another important thing is that you do not have to be an FNB bank account holder to take out funeral cover from FNB and enjoy all the benefits that come with being a policyholder.